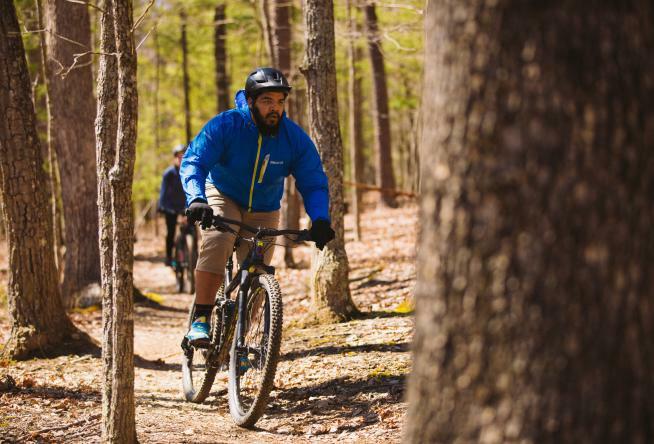 Virginia&apos;s Blue Ridge is the perfect destination for a mountain biking vacation, according to a new article by Bicycling Magazine. The story, titled "We Have the Perfect MTB Vacation for You" was written by Robert Annis, who was hosted on a visit to the region by Visit Virginia&apos;s Blue Ridge, which received assistance from local businesses and experts in the mountain biking community. During his visit, Robert had the opportunity to ride the trails at Explore Park and Mill Mountain Park, while also enjoying some of the local restaurants and breweries in Virginia&apos;s Blue Ridge. He also checked out some of the incredible road cycling on the Blue Ridge Parkway. "We rode up Woodthrush, connecting to Sidewinder and Ridgeline, and finally made our way to local tourist attraction Mill Mountain Star and gorgeous views of Roanoke. The whoop-filled descent down Understory and Monument was a fun, albeit way too short, slalom over loose rocks and jumps." Virginia&apos;s Blue Ridge is featured in the article along with Copper Harbor, Michigan, and Sedona, Arizona - two other popular destinations for mountain biking. The coverage in a well-known publication like Bicycling Magazine helps the region continue to establish itself as America&apos;s East Coast Mountain Biking Capital. See the article in its entirety on the Bicycling website.